Sound Skulptor introduces the new MP566 tube mic preamp in 500 format inspired by the preamps manufactured in the 50s. Manley adds three channels to its Core mic tube preamp and introduces the new Force model. Chandler Limited, in partnership with the Abbey Road engineers, has recreated the tube preamp that equipped the REDD.51 mixing consoles. Thermionic Culture has gain-boosted its Rooster two-channel preamp in this new generation that is expected at retailers this month. 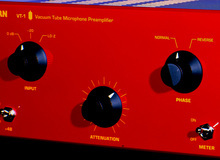 DW Fearn has expanded its VT-2 tube mic preamp to four channels and introduces today the VT-24. Crane Song debuts at AES this weekend its second 500 Series module, the Syren tube preamp. ART Pro partnered with Antares in order to equip their tube preamp with the Auto-Tune system. And here is the Auto-Tune Pre! Tube-Tech doubles the MP 1A with the MP 2A all-tube dual microphone preamplifier and DI that will be available in september.